It is useful to document REST APIs so that developers can easily develop applications that call these APIs. The OpenAPI 2.0 Spec and tools such as Swagger provide a standard mechanism to document REST APIs and provide a framework to test and develop applications that call REST APIs. In IRIS, the API management features make it easier to produce an Open 2.0 API description of your REST APIs. These features also provides a way to discover the REST APIs that are available on an InterSystems IRIS instance. For the HTTP action, select or specify GET. Where localhost is the name of the server, 52773 is the superserver port on which InterSystems IRIS is running, and namespace is the namespace you want to examine. Include the username and password for your InterSystems IRIS account. The REST call will return only the applications where you have access to the database that contains the dispatch class used by the applications. If the namespace is specified as %SYS and you do not have read access to the IRISSYS database, the request is run in the default user namespace. The default user namespace for this situation is USER; to override this, set the global node ^%SYS("REST","UserNamespace"). For the HTTP action, use GET. Where localhost is the name of the server, 52773 is the superserver port on which InterSystems IRIS is running, namespace is the namespace in which the REST service is running, and appname is the name of the REST application. You must have read access to the database that contains the dispatch class, as well as access to the namespace specified in the endpoint. The dispatch class namespace and the endpoint namespace need to be the same (except in the case of a dispatch class in a package starting with %, which is available to all namespaces). Copy the output from this call into the Swagger editor, which converts the JSON to YAML (Yet Another Markup Language) and displays the documentation. This Open API description is based on the information available in the URLMap definitions. Because the URLMap does not contain information such as the payload description and HTTP return values, you need to edit the generated documentation to add this information. 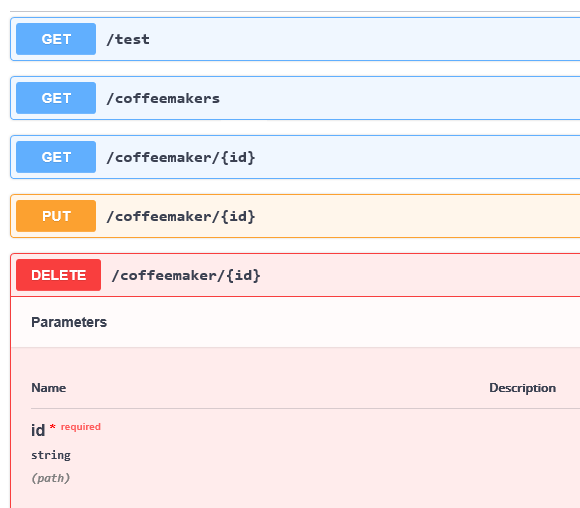 Use the Swagger editor to add to the documentation. Then the system adds entries to the ^ISCLOG global for any calls to the API management endpoints.